Win a $10,000 1952 Topps #311 Mickey Mantle by Consigning to Mile High Card Company at the National in Cleveland! Castle Rock, CO - The deadline for Mile High Card Company’s September catalog auction will be at the close of the National Sports Collectors Convention in Cleveland August 1st - August 5th and one lucky consignor will win a drawing for a 1952 Topps Mickey Mantle PSA AUTHENTIC with a value of approximately $10,000. For each $500 of value you consign to the September MHCC auction, you’ll earn one ticket for the drawing. The larger the consignment, the more tickets you’ll receive, but everyone who consigns to MHCC at the National will be entered. “Instead of just offering a bonus to the biggest consignor, we wanted every one of our partners to be in on the action. 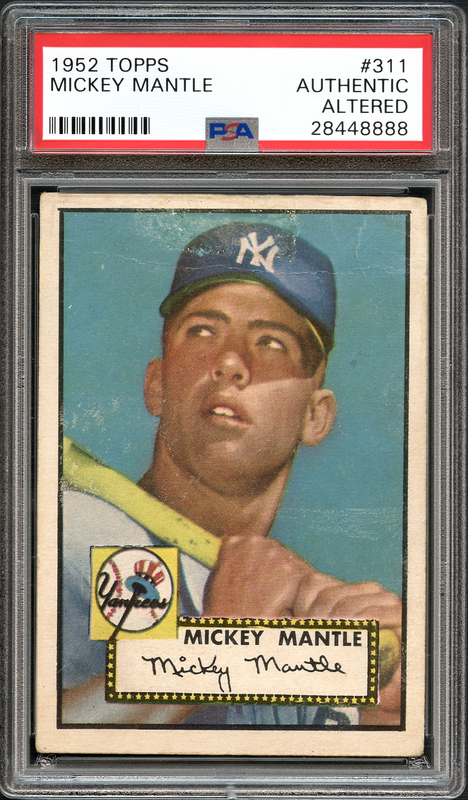 The ‘52 Topps Mantle is the pinnacle of post-war cards and we want every consignor to at least have a shot at it.” said MHCC President and CEO Brian Drent. Visit the Mile High Card Company Booth at #333 and #432 to submit your consignments and receive your tickets for the drawing. If you desire the maximum possible return for your prized sports cards and/or memorabilia and can’t make it to the National, please call our office at (303) 840-2784 to speak with one of our team of experts, contact us at www.milehighcardco.com.